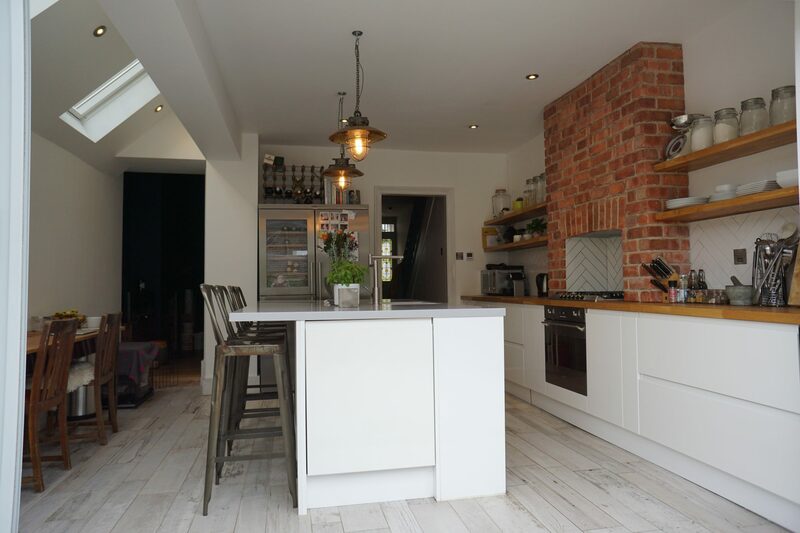 We were asked to help out when a project went slightly wrong at first, so we stepped in and created a beautiful side extension for this terraced house in the fashionable Poets Corner part of Hove. Removing the side wall of the house (propping up the bathroom above) inserting new steel columns to support this extension. 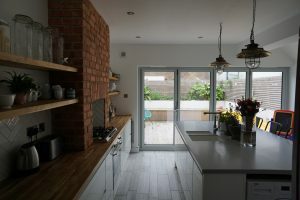 New foundations and a rear side wall, sloping roof and Velux windows with a large set of bifold doors to the rear made the rear of this house the luxurious space that this young family were looking for. We worked with the client to help out in the rest of the renovation work – but they project managed much of this themselves. Removing walls completely and supporting a house above it takes specialist skills and knowledge and shouldn’t be undertaken by anyone other than a qualified and insured builder like BGH. Our client narrowly avoided disaster when they realised that their original builder simply wasn’t up to the task. One luxurious item that the client had been dreaming of was underfloor heating in this new space. This involved a lot of soil being removed, the ground being taken down far enough to accommodate a solid sub base, sufficient insulation, and then a hot water underfloor heating system in screed. we worked closely with the client to incorporate into the work items that they wanted to organise for themselves and to work with other companies who were subcontracted directly by them.